The safety and security of fax-to-email has been a topic of discussion for many years. Whenever something new is introduced to the market with the promise to make life better and save time, there will be those who criticise and those who embrace and grow with the technology. The truth is, when compared to traditional fax, fax-to-email is actually safer and more secure, and would be especially beneficial to those who work with legal and highly confidential documents. However, just as with everything, criminal elements will always try to find a way to gain information and documents that they are not supposed to have access to. But the story doesn’t end there. There are measures to take to ensure that important information does not end up in the wrong hands. 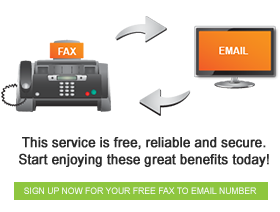 With fax-to-email you are sure that the person who receives the message is the correct recipient that the message was intended for in the first place as theY open their emails in their individual email account and not a general office fax machine. When you look at the above points in relation to traditional fax, you will realise that it is a no brainer that fax to email has more security features to safeguard your important documents.